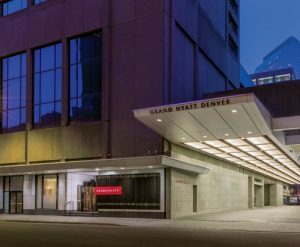 The CPDA 2019 Adjuvants & Inerts Conference will be held April 29-May 1 at the Grand Hyatt Denver located in Denver, Colorado. The Conference begins with an Opening Reception at the hotel the evening of April 29th, then continues with a day-long speakers program on April 30th, the Networking Reception that evening, and concluding on May 1st following a morning speakers session. The key note address of the Adjuvants & Inerts Conference will be given on April 30th by Dr. Terry Barr of CoBank who will offer his perspective on the state of the farm economy and share his predictions on the credit outlook for farmers as they prepare to buy seed and other production inputs for the 2019 growing season. Dr. Barr is a nationally recognized agricultural economist who has published numerous articles on key factors that impact the strength of the U.S. farm economy. On the afternoon of April 30th, the program will feature Mike Frank, Executive Vice President & CEO, Retail, of Nutrien who will offer his observations on the farm economy and its impact on agricultural lending, the ramifications for agriculture of U.S. trade relations with China and related tariff wars, the acceleration of corporate consolidation and its effect on the agricultural industry, and the integration of digital commerce as a key component of industry sales and marketing strategies. Day One of the speakers program will also include an overview of the ramifications of glyphosate resistance in Brazil and how this problem has impacted application technologies and the agrochemicals market in that country with a presentation by Dr. Ulisses Antuniassi, Professor at the Department of Rural Engineering in the prestigious Sao Pãulo State University (UNESP – Brazil). On the second day of the speakers program, attendees will have the opportunity to choose from one of two sessions (Session A and Session B) which will run concurrently in adjacent rooms at the hotel. Each of these sessions will have a broad topic or theme within which will be several presentations specific to that overall theme. Session A will address “The Overall Improvement of Spray Quality and New Spray Technologies” and will include presentations on advancements in the development of new nozzle types, the latest research on ultra-coarse sprays and test methods, and effective application technology for maximum deposition and coverage. Session B will focus on “Current and Future Trends and Challenges in Biostimulants” and will include a discussion of challenges in registering these products, biological needs and developments in pesticides and plant health, water sparring chemistries and how to measure them, and the outlook for the biostimulants market. The CPDA Adjuvants & Inerts Conference speakers program promises to be informative, comprehensive and educational. The preliminary speakers program may be accessed by clicking here. The CPDA Adjuvants & Inerts Conference offers ample networking opportunities for attendees with the inclusion of two receptions. Each of these events offers conference attendees the chance to network with familiar faces and to establish new business contacts within a casual setting. The first of these gatherings is the Opening Reception that will be held the evening of April 29 at the Grand Hyatt Denver marking the official start of the meeting. Dr. Greg Kruger, who is the Associate Professor in the Department of Agronomy and Horticulture at the University of Nebraska-Lincoln, has invited conference attendees to take a tour of the Pesticide Application Technology Laboratory at the West Central Research and Extension Center in North Platte, Nebraska. The research conducted there by Dr. Kruger and his colleagues focuses on maximizing pesticide application efficacy by utilizing different nozzle types, spray solutions, and pressure and sprayer modifications in seeking a better understanding of how best to improve application practices and minimize unintended drift. More information on the activities of the lab are available on its web site which may be accessed by clicking here. The tour of the lab facility is scheduled for Thursday, May 2nd from 9:00 a.m. to 12 noon. Please note that North Platte is easily accessible from Denver by car, being just a four hour drive away, and is also serviced by two non-stop daily flights from Denver into North Platte Regional Airport. Dr. Kruger has graciously offered to arrange shuttle service from the airport to his lab facilities depending on the number of individuals who will be flying in. Information on where to stay while in North Platte will be announced shortly. Should you wish to participate in the tour of Dr. Kruger’s lab facilities, you may indicate your intentions to do so when registering for the conference (please see registration section below). Sponsors have their company logo displayed on all pre-conference materials online and featured prominently in the conference program. CPDA extends its thanks and gratitude to the companies shown here that have demonstrated their generosity by committing to sponsor this year’s conference! 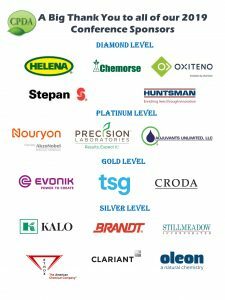 Please be sure to say hello when you see representatives from these sponsoring companies at the conference. Sponsorships are an excellent way to raise the visibility of your company at the conference and to demonstrate your support of CPDA as we strive to improve and enhance the quality of our meetings so that they provide even greater value to our members. You may indicate your company sponsorship when you register (please see registration section below). Should you have questions on sponsorship or would like additional information, please contact CPDA President Gary Halvorson at ghalvorson@cpda.com. The Grand Hyatt Denver is conveniently located at 1750 Welton Street in downtown Denver. CPDA negotiated a special conference rate for rooms, however the room block is now expired, as of Friday, April 12, 2019. You may still make your hotel reservation for the conference upon current availability and rates. To make your reservations, please click here. Online registration for the 2019 CPDA Adjuvants & Inerts Conference may be done by clicking here. If you prefer to register offline, the registration form may be downloaded by clicking here. Please complete the form and return to CPDA with your payment as instructed on the form. We encourage all to register early prior as onsite registrations will incur a $100 processing fee. Reminder: Whether you register online or offline, please indicate if you wish to be a sponsor of this year’s conference, and please indicate whether you plan to participate in the optional May 2nd tour of the Pesticide Application Technology Laboratory at the West Central Research and Extension Center in North Platte. Should you have any questions please contact CPDA’s offices at (202) 386-7407. We look forward to seeing you at the 2019 Adjuvants & Inerts Conference in Denver, Colorado!